Heater Sales is a proud Alberta retailer who offers products that deliver something that has historically enjoyed the same sort of popularity as food, shelter and oxygen. Indeed, heat is one of those essential elements of life that we don’t really miss until we don’t have any. 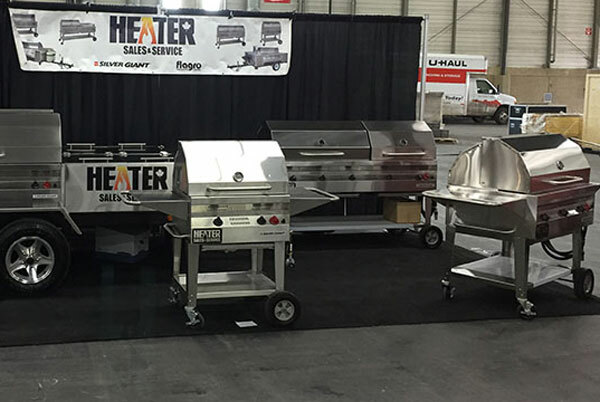 Therefore, being a leading supplier of an impressive array of warming, heating and large-scale barbecuing equipment means we end up at a lot of trade shows and sales events. Luckily, Heater Sales GM, Kurtis Wandler and his faithful sidekick, regional sales manager, Justin Klassen, love the excitement of these travelling fairs and always look forward to meeting the public at the four or five major events we gear up for annually. Along with office manager Barbara Rice and technician, Jordan Rice, we truly enjoy talking to folks about how our heating products can make their lives easier, more comfortable and always toasty no matter how minus the temperature insists on becoming. Edmonton’s Cottage Life and Cabin Show (CLCS) is the perfect opportunity for us to show you how to make your life not only comfier, but tastier, too! This is because, among the items Heater Sales is promoting at the CLCS is a new line of Yoder brand competition-grade smokers, grills and cookers. Yoder has a full spectrum of these units from barbecues built for your back deck, to trailer-mounted professional models, like the 20 foot Santa Fe. Another line of innovative products which we will be promoting is the Silver Giant brand of wheeled barbecues for gourmet grilling. We invite everyone who attends the show to weigh in on which unit they feel is “King of the Grill”. Of course to celebrate the Cottage show, we are offering special pricing at the event which we will honour for a full 30 days after the exhibition ends. Come out or call to see how we can save you on your next heater, smoker or barbecue purchase. Our attendance at the CLCS is a natural fit since everyone with recreational property knows that in our climate, without a dependable source of heat and weather-resistant grilling equipment, cool weather can ruin the cottage experience. Chattering teeth have a hard type singing “Kumbaya”, eating steak and quaffing cocoa, after all. With cooking and heating systems from Heater Sales, your family can enjoy your hard-earned vacation property year-round instead of just through our tragically short Western Canadian summers. A full line of parts and the service expertise to know where they go. Trust Heater Sales to keep you warm, dry and well fed when the rest of the world is cold, uncomfortable and hungry for great grilled grub. Come on down to our Nisku showroom or see us at the Cottage Show. Dates, times and admission information to the big event can be found here.